Absolutely perfect home on 7.84 wooded acres. This home has it all. Full brick exterior. 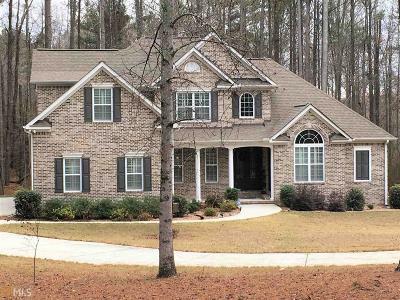 Large vaulted great room, formal dining with coffered ceiling, open kitchen with breakfast bar, granite and stainless appl, hardwood floors thru out the main level. Master and guest room on the main each with a private bath, a second master and guest room upstairs with private baths. Each master has a huge closet. Full unf. basement with lots of light, 9&apos; ceilings and open web construction, ready to be finished. 3 car side entry garage. Sprinkler system. Stunning custom double glass and iron entry doors. The main floor guest room has a separate exterior entry so it could be an office or an in-law suite. Gently used house. Gorgeous land. Directions: Hwy 85 Or 92 To Goza Road.